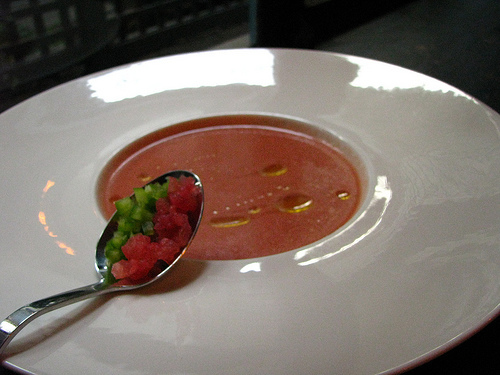 Not long ago I posted a recipe for a chunky California-style gazpacho. It was such a hit that I thought I'd share with you a more traditional, but just as delicious, recipe. The following recipe is adapted from the famous Spanish cookbook 1080 Recipes. Put the tomato, onion, cucumber, bell pepper, bread crumbs, oil, and vinegar into a food processor or blender and process until smooth. If the mixture is too thick, then add a bit of cold water. Transfer to a bowl, cover with plastic wrap, and refrigerate until fully chilled (about 2 hours). Season to taste with salt and pepper, and garnish with a bit of diced green bell peppers and tomato. A drizzle of a good quality extra virgin olive oil is quite nice too. How easy was that! Enjoy! That looks great! However, I had quite a few gazpachos in spain that included sherry in the mix, and I make it this way at home. I recommend giving it a try. This definitely reminds me of Spain .Thanks for sharing and I'll try it out this weekend.